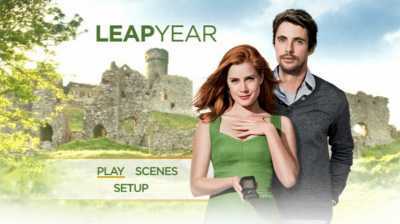 Leap Year is a 2010 Irish-American romantic comedy film directed by Anand Tucker and written by Harry Elfont and Deborah Kaplan. Loosely based on It Happened One Night, the film stars Amy Adams and Matthew Goode. The plot follows a woman who heads to Ireland to ask her boyfriend to accept her wedding proposal on leap day, when tradition supposedly holds that men cannot refuse a woman’s proposal for marriage. Her plans are interrupted by a series of events and are further complicated when she hires an Irish innkeeper to take her to her boyfriend in Dublin. The film Principal photography took place in County Wicklow, Dublin, County Mayo, and County Galway, with filming taking place in and around the Aran Islands, Connemara, Temple Bar, Georgian Dublin, Wicklow National Park, and Olaf Street, Waterford.